Behind sandy shores are paths through teeming marshes, patches of forest, rolling hills, and historic travel routes. Share your favorite hike(s) in this region. Click for information about submitting a hike description for our website. Summertime at the Jersey Shore evokes images of Atlantic City, hordes of summer sunbathers, and traffic crawling on the Garden State Parkway. When those crowds diminish, however, walkers have a chance to enjoy brisk autumn, winter, and spring treks along miles of empty beaches. Geologically, the Jersey Shore is part of the outer portion of the Atlantic Coastal Plain, a physiographic region that forms 45% of the land mass of the state. But behind these sandy shores, teeming marshes and patches of forest offer other delightful strolls over rolling hills, past wildflowers, and through bird-filled meadows. County and state parks offer glimpses into the past - the American Revolution, early industry, or a country estate. Since New Jersey is on the flyway for both spring and fall migrations, there are many places to observe these annual events. The Jersey Shore is not just resorts thriving on sandy beaches. It is also associated with lighthouses, historic villages, and wildlife migrations. It is because of New Jersey's long connection with the sea that, in 1988, Congress established the New Jersey Coastal Heritage Trail Route. The National Park Service, the State of New Jersey, and many organizations are working together to provide for public appreciation, education, understanding, and enjoyment of natural and cultural sites along the coast. The Coastal Heritage Trail is divided into five regions, linked by the common heritage of life on the Jersey Shore and the Raritan and Delaware bays. Five themes - maritime history, coastal habitats, wildlife migration, historic settlements, and relaxation and inspiration - focus on the various aspects of coastal life. 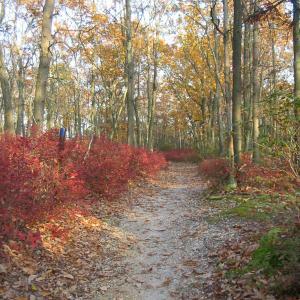 Although the New Jersey Coastal Heritage Trail is designed for vehicular touring, it connects areas of interest to hikers.